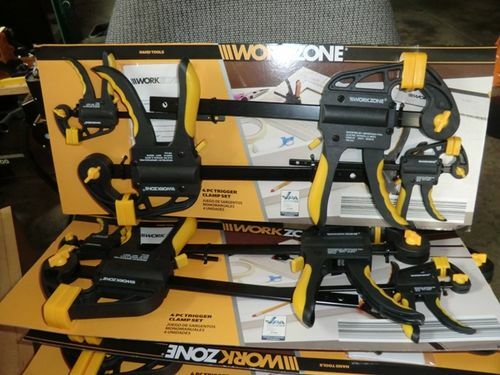 Saw the weekly Aldi ad that had sets of their “Work Zone” brand clamps priced at $9.99 (+ tax). While they may not be to some peoples standards, they work fine for my boxes. Price hard to beat for 4 small clamps, so I added to my clamp stash. If they work for you that’s all that counts.you say small? what size are they? surely you don’t mean you get 4 clamps for 9.99? That’s what he means Jim :-) I bought 2 sets a few years ago but they were only 2 clamps but they were a little larger (18” IIRC) and they’re still going strong. They don’t have nearly the clamping power of my Irwin quick clamps but they are a great value. I use them mostly to hold tools that I have mounted on plywood bases to a bench top. But, as the OP said, they will work fine for small assembly tasks like boxes. Jim – the larger of the 2 is listed as 150 mm (about 6 1/4” opening). The smaller one is listed as 100 mm (about 4 1/8” opening. And “yes” the price was $9.99 for the 4 clamps. These are not light weight metal. Looks like you can reverse them to use as spreaders also? Good deal if they work for you. SMP, you are correct. Neglected to mention the spreader option since I probably won’t use that feature. More clamps… yea! Long live Norm. Thanks for the info wncguy. I have been looking for a set of clamps to keep in my truck tool bag, you know, just in case. I will pick a set of these up! Edit, oh crap. Just saw this is ALDI and not LIDL. No ALDI around here! We have some ALDI stores, but some are only grocery, like a mini ALDI. I went in looking for the chisels Paul Sellers talked about and they looked at me like I was crazy. I need to find a full ALDI store driving distance. At that price they are cheaper than chip clips. SMP, you are correct. Neglected to mention the spreader option since I probably won t use that feature. I do like the spreader option in certain cases. For example when you dry fit a joint and its a bit too tight. I usually just hit it with a mallet, but have broken some tenons/mortise walls/dovetails, etc that way. The spreaders make it easy to separate and less likely to damage something. I neglected to mention that they also had a 2 pack of 300 mm clamps (about 12 1/4” opening) for the same $9.99 price. I am not a frequent customer at our Aldi’s but my wife goes there occasionally. They seem to have a small section where they periodically bring in tool related items.